Rafinesque’s big-eared bat is listed as “rare” in Georgia, and it certainly is unique. 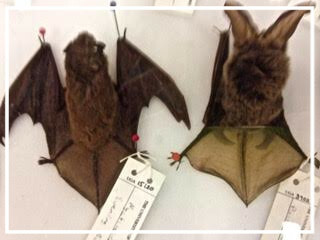 The photo shows museum specimens of an evening bat and a big-eared bat side by side. Look at those ears! A dead giveaway. All Georgia’s bats are in trouble because of a fungal infection named “white nose disease.” I used to see bats cruising behind my home in the twilight, feeding on the “aerial plankton” of insects among the trees. Not any more; bats numbers are way down. The big-eared bat isn’t so rare if you know where to look. Matthew Clement found numbers of them nesting in south Georgia swamps, in hollow tupelo trees. Branches of tupelo trees break off, leaving cavities where bats and other mammals may nest. Matthew picked off parasites from the big-eared bats and sent them to the Georgia Museum of Natural History. Among his collections I found a previously unknown species of chigger mite, a member of the genus Hoffmanniella. Its only close relatives are parasitic on vampire bats in Central America. Wow! Matt and I described and named the new species of chigger mite. Chiggers, of course, are an immature stage in the life of those mites. The adults aren’t parasites. I wonder if I might find adults of Hoffmanniella living in those hollow tupelo trees? It might surprise you to learn that other new, unnamed species may be found residing among the collections of the Georgia Museum of Natural History. Invertebrate animals such as insects and their relatives are diverse and abundant. It is the responsibility of the Museum’s curatorial staff to ensure that specimens are carefully curated, awaiting study by experts in natural history. For questions about bats, contact Nikole Castleberry at the Museum. Chiggers? I’m your go-to guy!